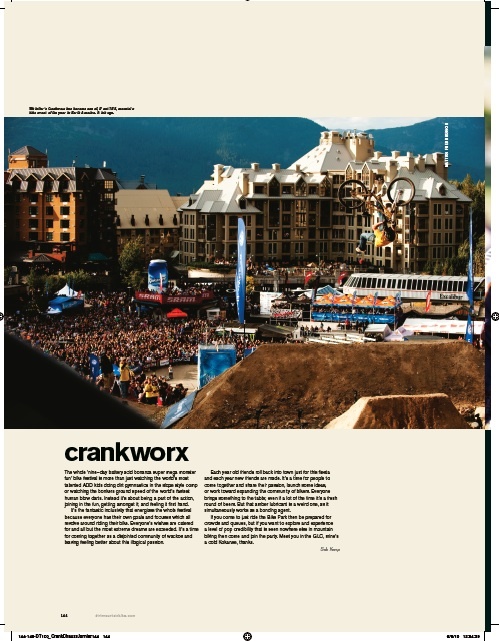 I’m currently writing a feature story for the local newsmagazine, The Pique, and was reminded of this I wrote for the 2012 Crankworx Joyride finals. The heat choked the air from lungs and drained sweat from pores, evaporating all energy and vitality from the town. Fleshy young girls and boys slunk around trying to find bodies of cool water and refreshment. Bikini trains led to the lakes upon which an armada of inflatable boats and beverages floated. Sweet conditioned air cooled the vehicles which crowded the serpentine route of the Sea To Sky, nose to tail like elephants carriages. The air was still and the heat seemed to press the peoples spirit to the ground. Heavy heat weighed on bodies but probably no one felt such gravity as the 18 riders awaiting their date with the biggest proving grounds in competitive freeride mountain biking. These riders lay in late, resting all they could before the date with the coliseum. All paths had lead to the Rome of slopestyle: The Red Bull Joyride slopestyle in Whistler. Meanwhile up in the atmosphere, clouds were building, and the pressure was rising. Particles were clashing, sparking off each other. Charges rising. The wind which blew up the Howe Sound was aimed straight at the open field of the Boneyard. A thunderstorm was predicted so the finals were moved forward to beat the weather. Clouds were growing as the crowds assembled to fill any and all available space. The loudspeakers blared, helicopters circled above, cameras of all shape and size aimed at estimated hotspots. The eight previous days of Crankworx had lead only to this moment.